In response, the versatility of the Grizzly's fists was sacrificed for heavy firepower in the form of heavy rocket racks. The Bruin retains the functional 75mm gun but its primary role is to crack bunkers, gun emplacements, and to blast apart heavy tanks with its rockets. 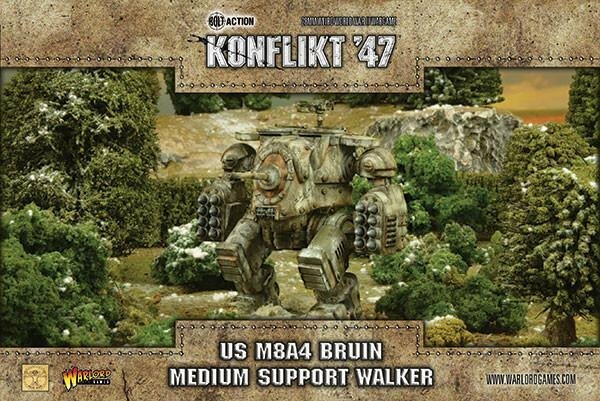 This Medium Support Walker has no need of HE for it's casement mounted AT gun as it uses direct fire with the rockets. Aim to get into a good position with troops supporting your advance before opening up - removing any obstacles in your armies way and allowing the swifter elements of your force to break through! Cost: 220pts (Regular), 285pts (Veteran). Weapons: Forward facing casement-mounted medium anti-tank gun, pintle-mounted HMG, arm-mounted heavy rockets (fires in left, right and forward arcs). Damage value: 8+ (Medium walker). Death in the Dark Continent.